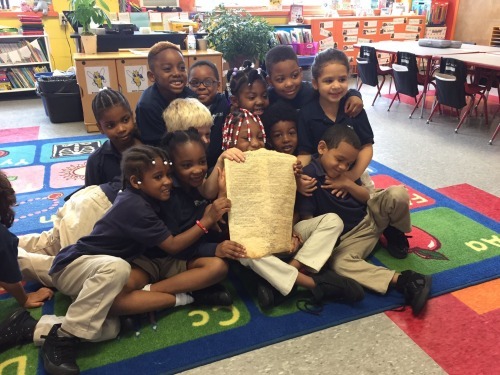 Emily Christman’s kindergarten class at Brooke Charter School in Boston, Massachusetts, love the Constitution, and they want to encourage you to support constitutional literacy! The principal at Brooke Charter School leads “morning motivation” for the kindergarten through second grade students. 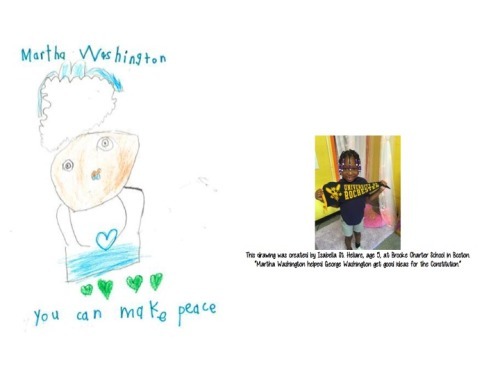 During these sessions, she focuses on teaching the young students how they can spread love in the world in many different ways, and often challenges the youngsters to come up with ways to spread love locally, nationally, and globally. 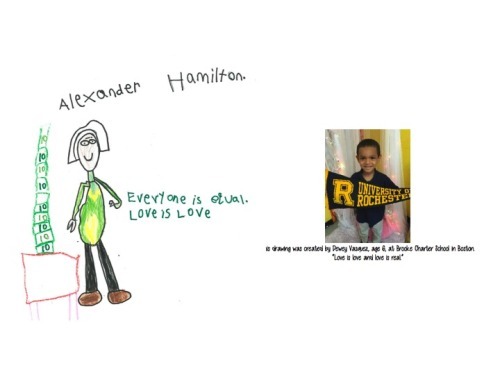 Emily Christman, an extraordinary educator, brainstormed with her kindergarteners and they came up with the idea of drawing pictures and cards to make people smile and to raise money for causes they thought made a difference in the world. They started by raising money for the American Civil Liberties Union. 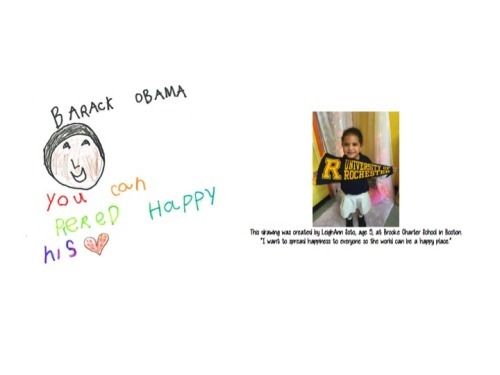 To the surprise of their teacher, her kindergarteners ended up raising about $18,000. 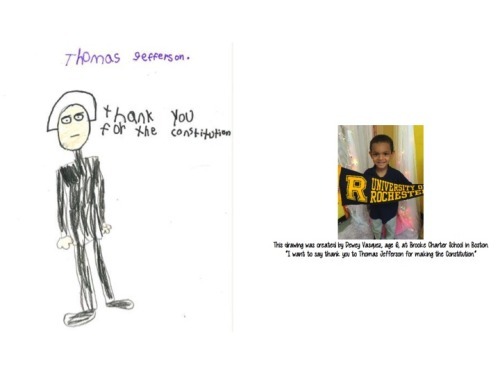 After accomplishing this extraordinary act of philanthropy, they decided to keep their civic activism going and have now decided to draw cards to support ConSource’s work educating citizens of all ages about the Constitution. 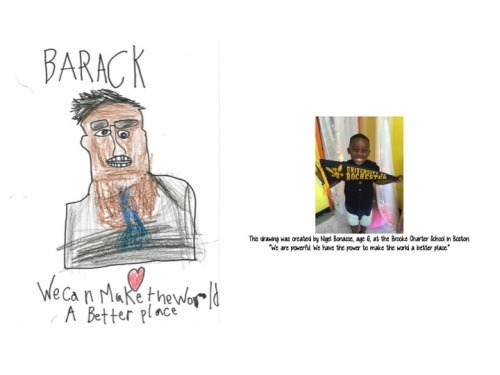 Below you will find the cards created by Emily Christman’s young students depicting some of their favorite figures from American history – from Abigail Adams and Alexander Hamilton to Barack Obama. On the front of the card, you will see the unique illustration created by the student, and on the back, you will find a picture of the student who created it and why he or she decided to draw the historical figure. 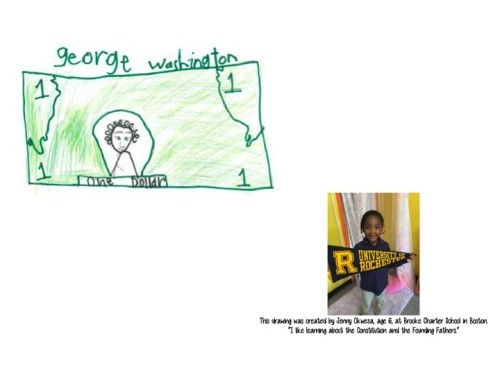 When you make a donation of $10 or more to ConSource, we will send you a copy of a card of your choice (please make a note of the student in the dedication field on our secure online donation page). 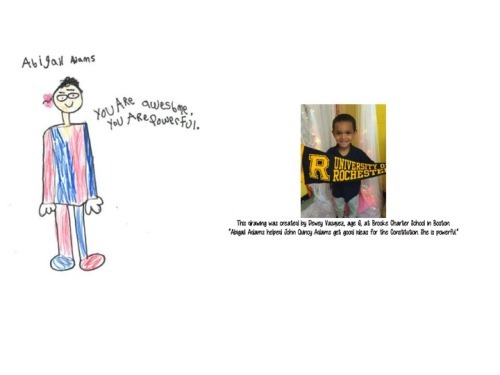 Please consider supporting these youngsters as they work to make an impact in the world! 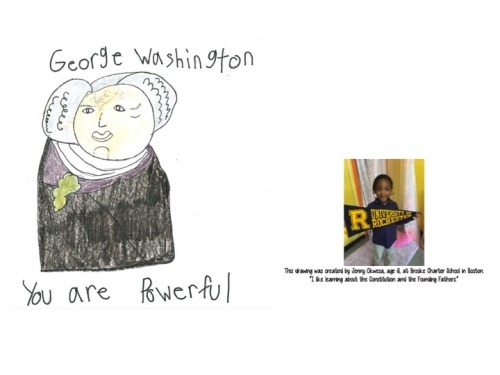 We know that their philanthropy and civic activism in the service of constitutional literacy will inspire you! It has certainly inspired the entire ConSource team! 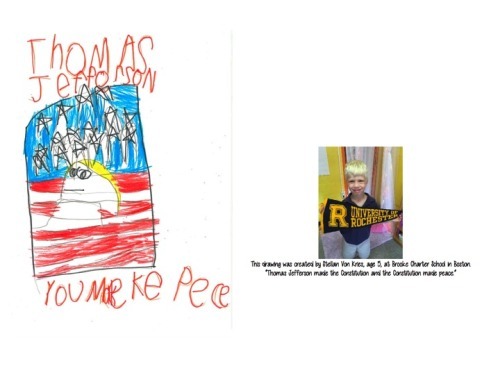 We hope to share with Emily Christman and her kindergarten class that they made a huge impact in promoting greater access to and understanding of the U.S. Constitution! *Cross-Posted with the ConSource Blog. On June 21, 1788, the United States Constitution became the official governing document of the United States when New Hampshire became the ninth of thirteen states to ratify it. On July 23, 1787, the Constitutional Convention delegates resolved, by a vote of 9 to 1, to send its proposed plan to Congress, with a recommendation that it be sent to “assemblies chosen by the people” in each state for ratification. Ratification by conventions chosen in each state by the people gave force to the Preamble’s opening phrase “We the People of the United States.” By eighteenth century standards, the ratification of the Constitution was an unprecedented exercise of popular sovereignty. America’s founding demonstrates that we are a nation because we chose to be one. The ratification period of 1787-88 was a vital stage in that process. And, yet, ratification was not assured. Supporters of the Constitution, who called themselves Federalists, won quick victories in four states in December of 1787. Conventions in Delaware, New Jersey and Georgia approved the Constitution unanimously. Large and diverse Pennsylvania also approved the Constitution, but opponents of the Constitution there were vocal and told their story to the nation, stiffening resistance elsewhere. Connecticut ratified next in January 1788, setting up the next struggle in Massachusetts. The Massachusetts convention went through the text paragraph by paragraph, and, in order to achieve a slim victory, the Federalists there agreed for the first time to recommend possible amendments to the Constitution. Ratification was secured by a vote of 187 to 168 in February 1788. Wins in Maryland and South Carolina followed thereafter in April and May of 1788, respectively. The Constitution then faced three critical tests in Virginia, New York, and New Hampshire. By this time, with eight states having already voted in favor of the Constitution, the Federalists were favored to prevail. New Hampshire would become the ninth state to ratify. Virginia and New York soon followed in late June and July of 1788, respectively. The votes were close in both states – with Virginia voting 89 to 79 to ratify with a recommendation that “subsequent amendments” be sent to the First Congress for their consideration. A list of proposed amendments from the states can be found here. New York was truly at the center of the ratification controversy, with Anti-Federalists and Federalists trading essays on why to oppose or support the new Constitution. According to John Kaminski, “no where else were the people as well informed about the Constitution as in New York.” This is, of course, where The Federalist (or Federalist Papers, as they are now commonly known) was first published. Despite the rhetorical firepower of Alexander Hamilton, James Madison, and John Jay writing as “Publius” in The Federalist, the vote in New York was extremely close – 30 to 27 – achieved on the promise of recommended amendments to the Constitution. North Carolina and Rhode Island did not ratify the Constitution until November 1789 and May 1790 respectively. We, therefore, ought to mark this day by studying the records of the Constitutional Convention, as well as the debates that occurred in the states during the ratification period. These materials today still define our shared political identity and serve as the basis for contemporary conversations about the Constitution. I hope you will join me and ConSource in celebrating the Constitution’s Ratification Day!